American rapper T.I. was born in Atlanta, Georgia, USA (September 25, 1980). His parents are Clifford “Buddy” Harris, Sr. and Violeta Morgan. T.I.’s music genres is hip hop. What are the most popular T.I.’s songs? What are the most known T.I.’s movies? Rapper, actor and record producer. Which award did T.I. win? T.I. won two times the American Music Award, three times Grammy Award and three times BET Award. 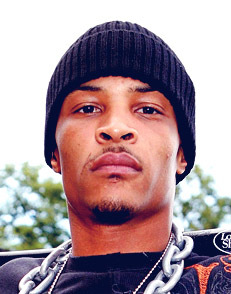 “T.I.P”, “Rubberband Man” and “King Of The South” are his nicknames. Who with did T.I. collaborate? T.I. collaborated with Drake, Jay-Z, Busta Rhymes, Kanye West, Lil Wayne, Justin Timberlake, Eminem, B.o.B, Kendrick Lamar and others. He married to american singer-songwriter Tameka ‘Tiny’ Cottle since 31 July 2010 and they have two children.